Home » india news » A khaki knicker's cry from the dustbin of time: "even deshbhakts dumped me"
A khaki knicker's cry from the dustbin of time: "even deshbhakts dumped me"
A khaki knicker's cry after RSS dumps it: "What will happen to my unique place in India's history?" Now I am gone. But there were days when I was feared. And often mocked. True, many respected me and some worshipped me. It was not just my khaki colour. It was that I adorned the waists of powerful men. I gave the powerful men the veneer of authority and moral sanction. I am referring to the police constable and also to the social and cultural evangelists some derisively called 'Sanghis', both of whom wore me, the humble pair of khaki shorts. There was only a slight difference between the two classes of people. The police had statutory power; the others just sought it. 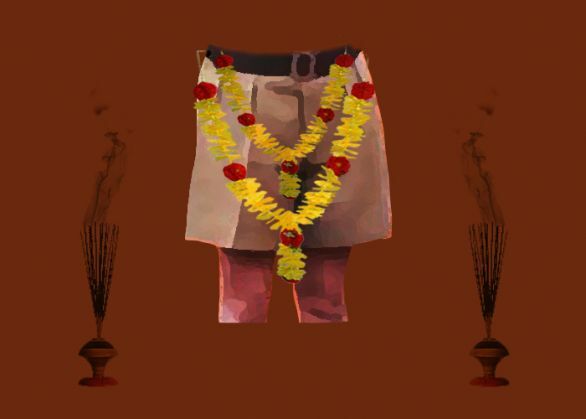 In some states, where the RSS was in power, all those whose ponderous waists I adorned (with gnarled, varicose-veined legs sticking out) appropriated certain unconstitutional powers. But then, in those days, I never complained. Because I, the pair of khaki shorts, was power incarnate. As soon a Sanghi wore me, he assumed a different stride. A stride that showcased valour and a certain hatred for the outcastes of Mother India or Bharat Mata, for whose protection he wore me. But why was I mocked, especially by youngsters? That's because I was just a pair of shorts, and not full pants. Even in the 1960s and 70s when I gave the police constable his pride and glamour, I was mocked. School and college students who walked down the main streets from Trivandrum in the south to Haridwar in the north, made signs at me. Some made the vulgar sign by cupping their palms. Others showed the more daring sign of the danda, the outstretched forearm, which had a double meaning, and ran away even before the police constable could react. So, in sheer anger, the police constable often picked up some stones and threw them at the children. Kids didn't dare do such things against the RSS men returning from their morning exercises wearing me. Because they were always more powerful than the police. Also, they had moral and caste sanction, they claimed. Who could throw stones at them or show them the vulgar sign of the danda? The RSS often said it controlled the police, and not the other way round. The RSS had adopted me from its inception, so I had a certain historical aura around me. The historical heft soon turned into everyday language, and the RSS man was always referred to as the knickerwallah - as if I was the cause of all his problems. Political fence-sitters were referred to as those who wore the khaki knickers underneath while wearing expensive trousers on top, presenting the veneer of the true-blooded liberal. Such people were mocked incessantly - "Yeh to knickerwallah hai"! I bore the brunt of all this mockery through the years, as India went through its ups and downs. To tell you the truth, the whole country was scared of me, because the man who wore me carried the lathi of moral indignation and perpetual victimhood in his hands. He often used it to show the 'other' Indians where they belonged. During arson and riots, I was a sought-after commodity, and once the RSS man wore me and took to the streets, I became the symbol of power. The man who wore me first imagined and then appropriated the 'pure India' (bereft of the depressed castes and minorities), for that is the India all of us wanted to inhabit. It is that India he had in mind when he shouted 'Bharat mata ki jai' before wading into the crowd or participated in a street march, much like the army. When he and his colleagues marched while wearing me and my colleagues, people looked at us with fear and adoration. Who could stop us? Now, I am reminded of the 1970s when the police dumped me. My main patron, the deshbhakt, is also dumping me. 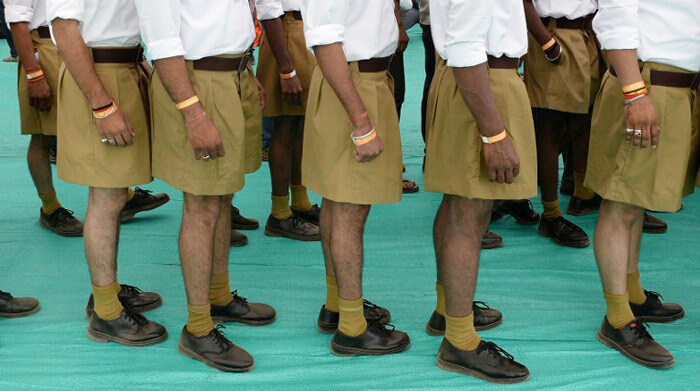 From Nagpur, where there are more khaki shorts than oranges, comes the news that even deshbhakts will start wearing brown pants from now on. I feel distraught, to put it mildly. What will be my position in Indian history if even the true lovers of the country throw me away and start wearing brown pants? I was handstitched by the deshbhakts' families. But now, they too have fallen victim to the mall culture. Imagine deshbhakts queuing up inside malls to buys brown pants. What a fall, my dear deshbhakts. Bargain: Why isn't Gen Raheel Sharif staying on as Pakistan Army chief?